George Edward Miller was born March 23, 1888 in Sutton, Nebraska, the son of Johannes O. and Alice Müller (later Miller) from Norka, Russia. George attend the Williams Avenue Grammar School from 1894 to his graduation from the 8th grade in 1902. His twin sisters gave him his middle name of Edward when he was in the first grade. ​His first two jobs were with a wholesale drug company and a wholesale coffee and tea company. In 1908, he followed his brother Adam and became a sheetmetal worker. George married Katharina (Katy) Sauer on June 15, 1910 in the Ebenezer German Congregational Church. Katy was the daughter of early Portland pioneers Ludwig and Magdalena Sauer. From 1913 to 1916, George and his brother, Adam, were co-owners of Miller Bros. Sheet Metal on Union Avenue. Profits from the business turned out to be small and George decided to take courses in bookkeeping. ​George went to work as a bookkeeper for his brother, John W. Miller, who had founded the Coast Fir Lumber Company. George soon became a successful lumber buyer which launched him into his own successful career. George was one of the pioneers in the Oregon lumber business and the first lumber buyer to call on the mills south of Portland. He founded the George E. Miller Lumber Company in the early part of 1931 during the heart of the Great Depression. George would again work with his brother John W whose own business had failed in 1929 as the markets crashed. In 1940, George purchased the Cascadia Lumber Company in Sweet Home, Oregon. The mill burned to the ground in 1943 and was rebuilt. He sold this mill in 1952, but the prior year he had purchased a much larger mill in Toledo, Oregon, keeping the Cascadia Lumber Company name. As his business expanded, George moved into the Lumberman's Building in downtown Portland. In 1949, he rented a suite of rooms in the Equitable Building for his staff of 25 people, Several of George's children worked with him in the business. The company would earn Dun and Bradstreet's highest rating. George served on several boards, including his church and the Union Gospel Mission in Portland. He was an active member of the Gideon and donated money and lumber to many charitable causes. In 1959, he sent clothing, food, sewing machines, pianos and other materials to the Presbyterian Mission in Korea. In June of that year, he traveled to Korea to visit the missions to see for himself how the support was being utilized. George was proud of his Volga German ancestry and wrote an article about his Christmas Memories for a lumber trade publication in 1951. George E. Miller died on June 2, 1966 in Portland. 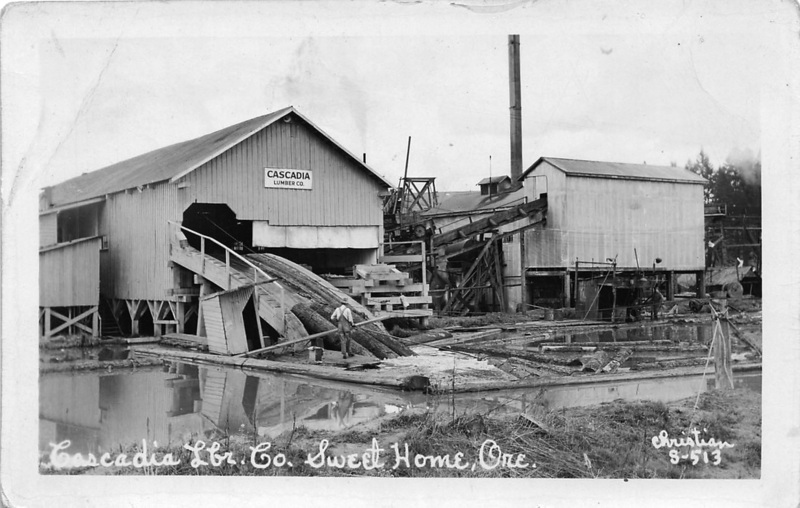 Postcard of the Cascadia Lumber Company in Sweet Home, Oregon. Courtesy of Steven Schreiber. Obituary for George E. Miller, The Oregonian, June 5, 1966, pg. 11.